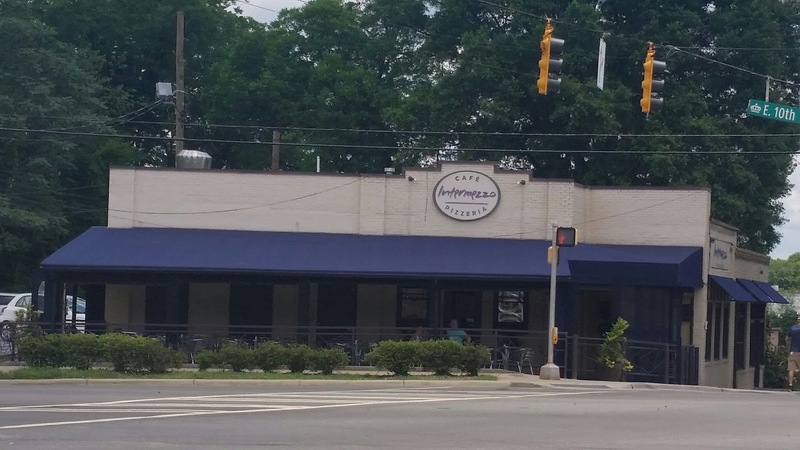 This edition of “Excited about Eating” takes us back to the Plaza-Midwood neighborhood of Charlotte, to a restaurant recently featured on Food Network’s “Diners, Drive ins and Dives,” Intermezzo Pizzeria and Café. This European style restaurant serves hand-tossed pizza and traditional Serbian dishes. It reminded me of some of the cafes we visited on our past trips to Europe. Dora here. Yeah, especially the cozy interior with brick exposed walls and only a smattering of tables and booths surrounding a hearth-like bar. But they don’t need many interior tables with this generous outdoor patio! After DDD’s feature, I was all set to order the cabbage rolls (Sarma), but they were out. 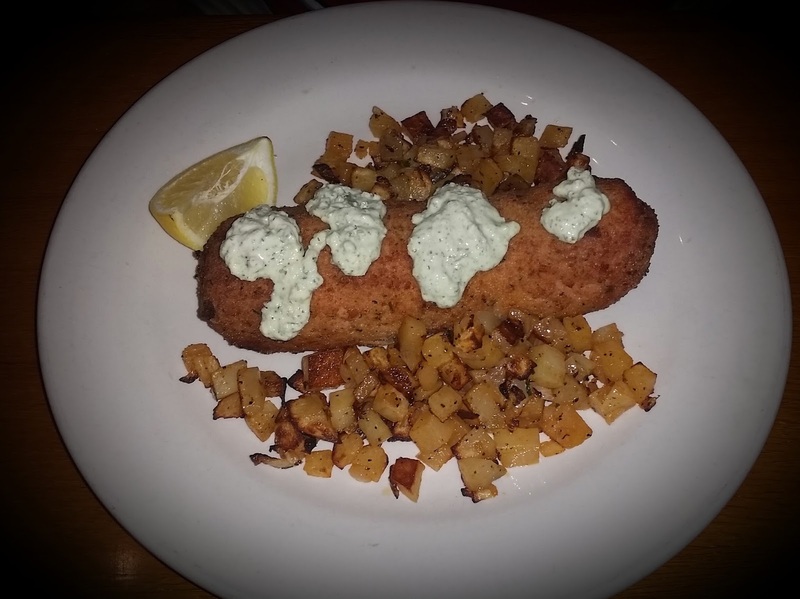 So, at the waiter’s helpful recommendation, I ordered Karadjordjeva, a ham and cheese schnitzel breaded and pan fried, served with skillet potatoes and tartar sauce, although not the typical American tartar sauce, with a definite hint of dill. Similar to Cordon Bleu, but elevated a few notches, especially with the drizzle of lemon on the top. Dora here. 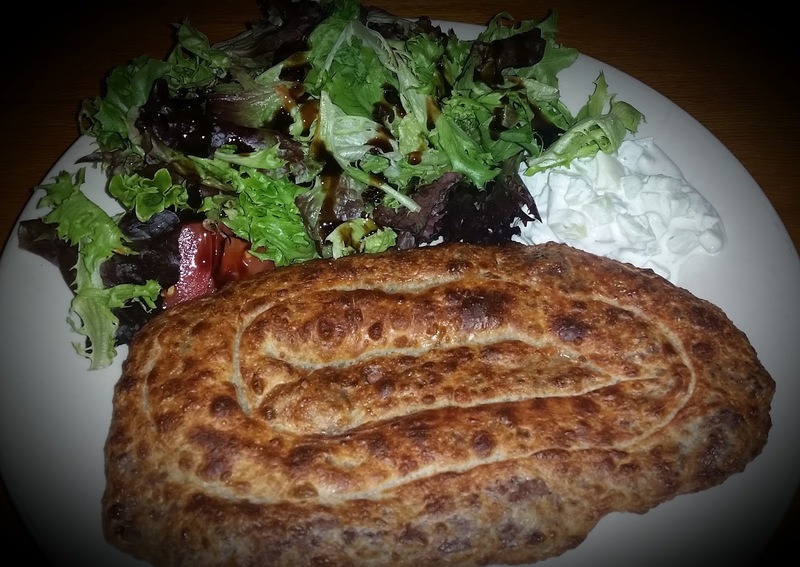 I ordered the Burek, ground beef and onions baked in Fillo dough. An unusual combination, right? But isn’t it beautiful? Nothing spicy or too complex. After a few bites what came to mind was comfort food, much like Mac ‘n Cheese is to Americans. Between Ernie and I, we finished off the whole thing. Didn’t touch the salad, but that cucumber mixture made for a nice dipping sauce.